I drank my first beer in the great state of Kentucky. Being raised in a dry county (the nearest place to purchase beer was in Jellico, Tennessee) meant that if the young country bucks I ran with were going to find adult beverages we were going to have to visit a bootlegger. Louise was an enterprising woman who ran a brothel and beer store out of a wood frame house at the top of a holler on Moore Hill, just outside of Corbin, Kentucky. One of my running mates told me of this boozy wonderland, and we made our way with great haste to see if we could procure some delicious beer and retire to a nearby field to get drunk. Little Kings Cream Ale was the beer of choice for bootleggers in those halcyon days. A 7oz bottle would set you back $2, a king’s ransom back in the 80s, but a tariff we were more than willing to pay. This set the tone for my teenage years. Save up money from working in the fields, and hit Louise’s on a Saturday night to fuel our rural revelry. These days young men in the coalfields of Eastern Kentucky have decidedly better beer options. Like bourbon barrel aged ale from the good folks at Alltech Brewing in Lexington. I’ve drank more than my fair share of this beer on trips to Kentucky, and can confirm that it’s one of the planet’s great beers. The organizers of the recent Brussels Beer Challenge apparently agree as they awarded the brew a bronze medal in the “flavoured beer, wood aged” category finishing just behind Dragon’s Milk from New Holland Brewing Company. As near as I can tell there was no gold medal awarded. Alltech also landed a gold for their Kentucky Kolsch in the “pale and amber ale” category. I’m planning a holiday trip to Kentucky soon and will be bringing back a suitcase filled with brew from the region. Alltech Brewing will have a hefty compartment allotted to their world class beer. 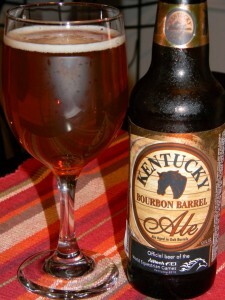 This entry was posted in The Rural South and tagged alltech brewing, bourbon barrel aged ale, kentucky craft beer. Bookmark the permalink.